Ireland was the first colony of imperialist Britain. 100 years ago this week, several thousand Irish men and women rose up, arms in hand, to oppose British colonialism. There are many lessons of that uprising. The main one being that national struggles cannot be successfully separated from the class struggle, and those who attempt to do so always end up opposing the interests of the workers in their own country. Here, Finn Geaney explains the history of that rebellion. 100 years ago this week, April 24th 1916, a few hundred men and women, members of two armed bodies, the Irish Volunteers and the Irish Citizen Army, seized control of a number of key buildings in Dublin and held out against British forces for almost a week. Extensive repressive measures followed the defeat of the Rising. 171 prisoners were tried and 90 death sentences were imposed, of which General Sir John Maxwell confirmed fifteen, including all seven signatories of the Proclamation of the Provisional Government of the Irish Republic. Sir Roger Casement was later hanged in London’s Pentonville Prison for his part in preparations for the Rising. More than 3,500 men and women were arrested immediately after cessation of hostilities, and more than 2,000 of these were transported to prison camps in Britain. The fifteen executions that were carried out in Dublin were spread over a period of ten days. This widespread repression contributed significantly to the growth of resistance to British rule in Ireland. 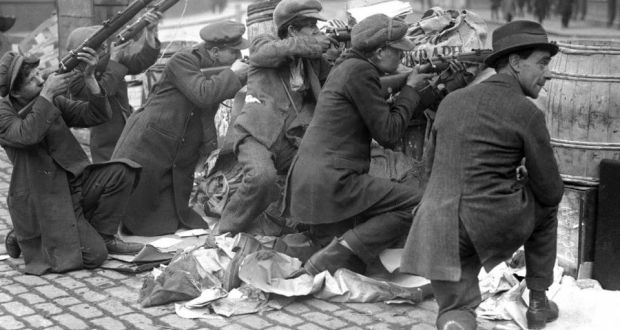 The Uprising in Dublin in Easter 1916 was mainly an uprising of the Dublin working class. The two main military organisations that participated were the Irish Citizen Army, a workers’ army linked to the Irish Transport and General Workers Union, and the larger Irish Volunteers, the overwhelming majority of whose members were workers but the principal leadership of which were largely middle class and aloof from labour struggles. Some of them were hostile to the aspirations of the labour movement. Of the men and women who were arrested in April and May 1916 in the immediate aftermath of the Rising it is estimated that more than 80% were workers. There were many women members of the Irish Citizen Army. Helena Molony, leader of the Irish Women Workers Union, said that all the women of the Workers’ Coop were members of the Citizen Army. The Constitution of the Irish Citizen Army stated that ‘the ownership of Ireland, moral and material, is vested of right in the people of Ireland’. The Irish Republican Brotherhood (IRB), a secret, oath-bound body, was behind the setting-up of the Volunteer movement, and it controlled the Irish Volunteers by infiltrating its leadership. Tradesmen were predominant in the membership of the IRB in Dublin, but they were absent from the principal leadership bodies and from the Military Council. Many workers with the Dublin Corporation were also members of the IRB. This was a far different perspective from that of some other leaders of the 1916 Uprising. Padraig Pearse, nominated by the IRB as Head of the ‘Provisional Government’, elevated armed conflict and the struggle for Irish independence from England to a quasi-religious status, comparing himself to Jesus Christ. He wrote of the beneficial effects for society of the bloodletting of World War 1, referring to the ‘red wine of the battlefields’ across Northern Europe and the ‘homage of millions of lives given gladly for love of country’. Connolly wrote a blistering attack on that analysis. Padraig Pearse and Tom Clarke, two of the principal leaders of the IRB, favoured the installation of a German king in Ireland, should Germany be successful in the War. The struggle for Irish independence that broke out in 1916 was not a new endeavour. An uprising in 1798 led by the United Irishmen was inspired by the French Revolution of ten years earlier. Again in 1848 the Young Ireland movement for national independence had links to similar organisations on the Continent. The Fenian uprising of 1867, though a military failure, kept alive the tradition of struggle for national independence. The IRB evolved in the 1870s from the Fenian Brotherhood in the United States and in Dublin, with the sole aim of creating by force of arms an independent Irish State free of British rule. By the turn of the century the IRB had significant numbers in Ireland. What distinguishes the 1916 period is the active intervention of the organised labour movement. The Rising itself came after more than a decade of growing trade union militancy across many areas of the country including Dublin, Belfast, Sligo, Cork and Wexford, and culminating in the massive strike and lockout of 1913. Not only had the trade union movement gone through significant growth during that period but the Irish Labour Party was created by the trade unions. In addition small socialist groups, such as the Socialist Party of Ireland had begun to influence the leaders of labour. James Connolly argued strongly against the futility of a movement dedicated solely to physical force. The Irish Volunteers emerged in 1914 from a split in the mass Volunteer movement, then over a hundred thousand strong. This armed organization had been set up to defend the Irish Home Rule Bill that was then going through the Westminster Parliament. Eoin MacNeill, a constitutional nationalist, was asked by the IRB to be its leader. However, in the North of Ireland a large majority of Unionists opposed Home Rule. The Unionist leader Edward Carson had already created an armed force there for the purpose of resisting Home Rule. In this he was supported by leaders of the British Tory Party and a group of army officers based in the Curragh. In September 1914, a majority of the Volunteer movement supported a call by John Redmond MP for enlistment by Irishmen on the side of England in World War 1. The minority, less than ten per cent of the total, became known as the Irish Volunteers. It was a section of this latter force that came together with the Irish Citizen Army in a common struggle at Easter 1916. In the months immediately prior to the Rising Connolly, on hearing of the IRB plans for an insurrection, had discussions with their leaders and agreed to unite with them in the military struggle. The Irish State that emerged after the events of 1916 and the following years fell far short of that envisaged by James Connolly. Ireland was divided. The North became a sectarian state dominated by unionists. The South became a conservative, Catholic state with widespread poverty, continuing emigration and denial of women’s rights. One group of the surviving participants in the Rising, people like Collins, Cosgrave and Fitzgerald were the progenitors of what later became the Fine Gael Party, a conservative, Catholic political force. A second group, led by DeValera, Lemass and MacEntee founded Fianna Fáil in 1926, another conservative, Catholic Party. Yet a third group, a small group of militarists, keeping the name of Sinn Féin, declared the Army Council of the IRA to be the only legitimate government of the Irish Republic and rambled off into the fringes of Irish politics, remaining there for more than fifty years – during which time they attempted to link up with Nazi Germany in World War 2 – before a minority of that group, went on to form today’s Provisional Sinn Fein. The labour movement lost its most significant leaders. James Connolly, leader of the Irish Transport and General Workers Union and of the Irish Citizen Army, was executed, as was Michael Mallin, also a leader of the Irish Citizen Army and one time secretary of the Silk Weavers Union. Richard O’Carroll, a Labour Councillor on the Dublin Corporation and leader of the Bricklayers’ Union, was murdered by a British Army Captain. Peadar Macken, a member of the Executive Committee of the Dublin Council of Trade Unions, was killed in the fighting, as were many other trade union members. Several trade union and labour leaders were arrested and interned after the Rising. Jim Larkin had been in America since 1914. In the years immediately following the events of 1916 labour leaders gradually withdrew from the struggle for national independence, allowing a political vacuum to develop. As the Irish Party at Westminster became more and more discredited the Sinn Féin Party was enabled to grow, from a mere sect to a mass party. The organised labour movement, at one time to the forefront in the national and class struggles, took a back seat. Leadership of the Irish Trades Union Congress and Labour Party fell to Thomas Johnston, a man who had no connections to the revolutionary traditions of Irish labour and who remained tied to conservative and bureaucratic ideas. Other labour figures like William O’Brien, at one time a close colleague of James Connolly, directed his new focus just to building the membership of the ITGWU. In the immediate aftermath of 1916 there was no revolutionary Party to seize leadership of the movement. Sinn Fein took no formal part in the 1916 Uprising. Arthur Griffith founded Sinn Fein in 1905 around a political program that called for a dual monarchy with Britain and Ireland, based on the Austria-Hungary model, and a series of demands to support Irish capitalists such as tariffs. Griffith opposed the Dublin workers in their 1913 confrontation with the Dublin employers. He was opposed to armed resistance. Griffith also supported the anti-Semitic campaign against Captain Alfred Dreyfus in France at the turn of the century, as did other nationalists such as Maud Gonne. Sinn Fein had some support around the beginning of the century and worked with other organizations such as the Gaelic League, an Irish language movement, and other cultural bodies. But by the time of the Easter rebellion membership of Sinn Fein scarcely extended beyond one branch in central Dublin. Until 1917 the policy of Sinn Fein called for support for ‘King, Lords and Commons’ for Ireland. The Easter Rising was labelled ‘the Sinn Fein rebellion’ in an attempt to discredit it and to present it as the work of an insignificant and deluded minority of the population. Partly as a consequence of the failure of the labour leaders after Connolly to remain in the vanguard of the movement, Sinn Fein was able to fill the political vacuum. It is estimated that perhaps one thousand people took part in the insurrection in 1916, seven hundred in Dublin, where the only serious action occurred. A number of small, uncoordinated skirmishes broke out in a few other parts of the country. The Rising of 1916 was not a mass movement. Although labour leaders were deeply involved no strikes were called in support of the insurgency. Nor was any link forged with the most industrialised part of the country at the time, Belfast. There were also military and tactical failures, such as the absence of clear military aims in the various buildings that were seized in Dublin, the capture by the British of a consignment of German arms off the Kerry coast and a countermanding order against mobilization from the leader of the Irish Volunteers Eoin MacNeill. The Rising itself was focussed around a secret IRB conspiracy and was driven by a small Military Committee within that organisation. The ‘Workers’ Republic’ that Connolly had been campaigned for was supplanted by a demand simply for national independence. Lenin referred to the events of 1916 Rising as an uprising of ‘a section of workers’, and commented that the ‘misfortune of the Irish’ was that the ‘European revolt of the proletariat’ had ‘not yet matured’. Two years later there were mass uprisings by the labour movement across the continent against the major capitalist powers, in Germany, Austria, Britain and other countries; and in 1917 the Bolsheviks were victorious in Russia. In Ireland also in 1919 there was widespread labour activity, involving strikes and workers’ councils or soviets. Lenin took issue with those critics of the Rising who declared that national independence struggles were no longer relevant in the age of modern imperialism. In fact in organising a revolt against Britain, the major colonial power, Connolly was closer than his critics to the declaration of the Second International that in the event of war the organised labour movement of the various countries would rise in common cause against the ruling class of their individual countries. The official scenario for 2016 in Ireland will provide an opportunity for conservative forces in the country to propagate a nationalist consensus empty of class content. They will try to eliminate the key role of the labour movement. Men like Padraigh Pearse, a conservative Catholic nationalist, have always been elevated, to the detriment of James Connolly, Michael Mallin and other labour leaders. However a number of trade unions and the Dublin Council of Trade Unions will be organising their own events for 2016 and publishing separate material which emphasises the key positions occupied by socialists of the period, in both the political and military fields. > The article above is reprinted from the Oakland Socialist website.